The week has almost come to an end, and what better way to end it than getting the latest scoop and info on The Strokes’ front. 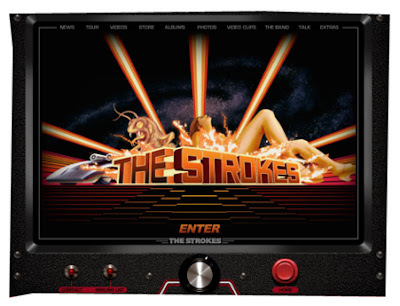 The Strokes are up and running with their new site, designed entirely (if I’m not mistaken), by Warren Fu who also happens to be the director of the latest Strokes video, the alternative version of ‘You Only Live Once’. Speaking of the video, it’s nothing out-of-this-world or anything because it looks just like one of the various Strokes fan video that you can see on YouTube - just some clips edited from their older performances. Only difference is, it has the 2001: Space Odyssey vibe going on which I might add is pretty impressive. But then again, they might as well say, The Strokes did a new video for the song ‘I’ll Try Anything Once’ and could’ve taken my video that I did which I’ve uploaded on YouTube. (Click here). But, if you still want to watch it you can do so by clicking here. I’m not the type of Strokes fan that would constantly visit their website, because I don’t find anything interesting there. I’d prefer to visit Strokes’ Fan site She’s fixing her hair because of the *ahem ahem* free stuff they give away. I thought they’d be adding new material like lyrics, but I didn’t see any sign of lyrics. It would be great if we’d finally get to learn the true lyrics to the songs rather than just assuming what the words are, because trust me, you cannot imagine what the strokes fans has come up with. She’s fixing her hair has even been decent enough to post up new photos of the band that they’ve recently put up; new photos as in the ones that we haven’t seen yet, not the latest photos as in the extremely recent ‘2007’ ones. The Strokes are definitely one of the best bands photographed. I don’t know whether it’s because the photographer is a genius or the guys are just simply hot. I’m gonna say both. So, these are the new photos and some of which that I just had to put up. If you’re not a Strokes fan, you can still enjoy it because of the aesthetic aspects (?? ), yeah aesthetic aspects. It took me a while to realize what was wrong with this picture. 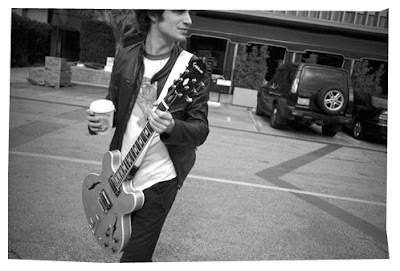 Then I thought, oh yeah, Fab holding a guitar. Fab playing a guitar…, now that I’d like to see. 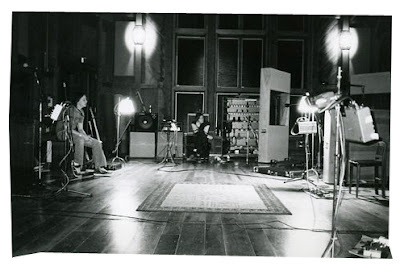 Luurve pictures during recording or rehearsing session, it’s where all the magic takes place. There’s loads more from where it came from,you can look it up yourself here.